A Daily Dose of Fit: Something new and exciting. I ran my very first half marathon in 2009. It was in September, a few weeks before my wedding. I trained all Summer while actively planning the biggest day of my life. At the time, I was also transitioning from a career in advertising to a career in the fitness industry. I loved running, but it hadn't yet become my thing. I ran the 13th Annual Chicago Half Marathon in 2:34:31. I swore to myself that I would never run another half marathon again. It was too much. I was sick of running long distances, and I remember feeling as though I was in a permanent state of exhaustion. 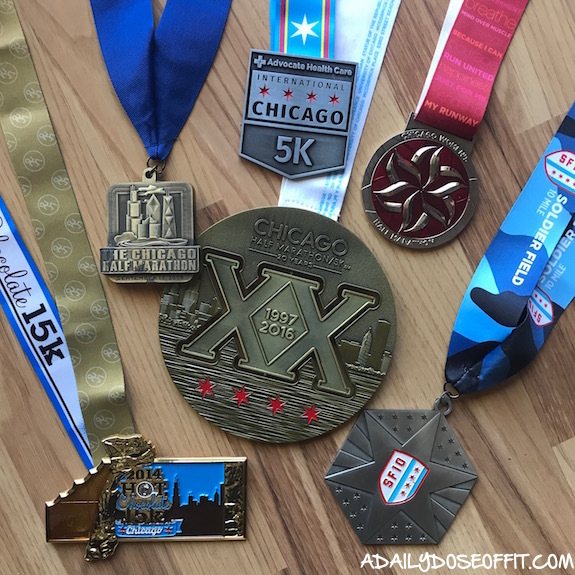 Looking back, I realize now that, although I got through it, I didn't exactly approach my first half marathon with enough knowledge or understanding of what it takes to run longer distances. I just thought you had to build up the miles and be done with it. Again, running had not yet become my thing. Long story short, it wasn't my first half marathon. I've run countless half marathons since, and my current PR is 1:47:22. Proof that I've learned a lot since my first half marathon. And that running is now my thing in more ways than one. Most recently, I ran the Advocate Health Care International Chicago 5K. If you're not familiar, it's the 5K that precedes the Bank of America Chicago Marathon. And that's the new and exciting thing that I'm working on: I threw my name in the hat for the Bank of America Chicago Marathon in 2019. I also applied to participate on a charity team. So one way or another, I'll be there. And I'm very much looking forward to sharing my journey.